See my article on this hike, “Find a Trail to History,” in the October 2017 issue of Northwest Prime Time. 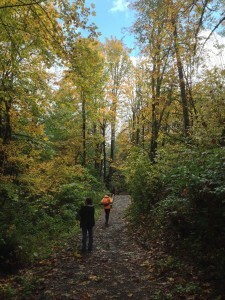 The Coal Creek trail to Redtown, site of industrial mining in the late 1800s, was the first hike I did in Washington and the inspiration for Hiking Washington’s History. I could walk out of my suburban home, follow a social trail down a hill, then a deer trail through wet land to Coal Creek. 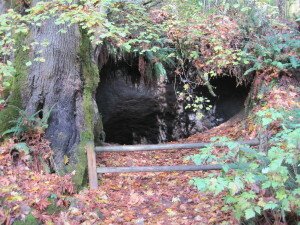 The trail followed the creek, past an old farm-site (with apple trees), past mining artifacts (wagon wheels chained to a tree, chunks of coal), onto the old road-bed of the Seattle and Walla Walla Railroad, past a cinder mine and the remains of the railroad turn-table, and finally reached Redtown. Near the end of the hike there were old interpretive signs and a black hole in the ground–an air shaft going down 100 feet to the mines. The trail was rich in both natural and human history. 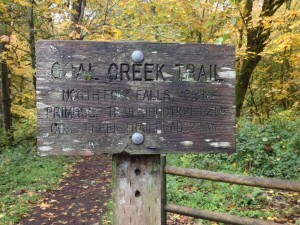 In the 30 years since my first hike King County has greatly improved the trail, part of the Cougar Mountain Regional Wildland Park. Updated, easy to read interpretive signs mark the Redtown end of the trail. Bridges and stairs have been constructed. The Primrose loop has been restored. The most important charms remain–the concrete blocks of the turntable covered with fall leaves, the North Fork falls full in October, the remains of a wood-constructed plume in the creek and the visible coal seam, even the bricks discarded from the Mutual Materials lot, now a housing development. You can still walk this three-mile trail, out of sight of homes or parkways, and be greeted by this weathered sign, an historic artifact on its own.